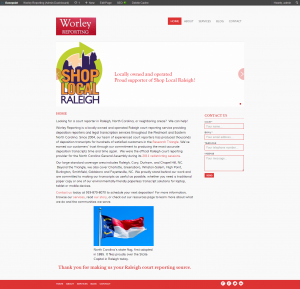 On October 18, Worley Reporting launched a brand-new website for the first time in four years. We are excited about our fresh, more user-friendly look which includes an updated contact form for users. It also includes a blog where our staff can discuss issues relating to court reporting in North Carolina. After a particularly hectic stretch of turning out high-quality deposition transcripts for our North Carolina attorneys, we’re having a real blast assembling an informational resource we believe will help serve a variety of users interested in our company and our community. Special thanks to the outstanding staff at Southpoint Media for making our new site (and our previous one) possible! Keep an eye on our site for more updates in the near future.